This book is written by the author of The Secret Language of Leadership—a Financial Times Selection in Best Books of 2007. 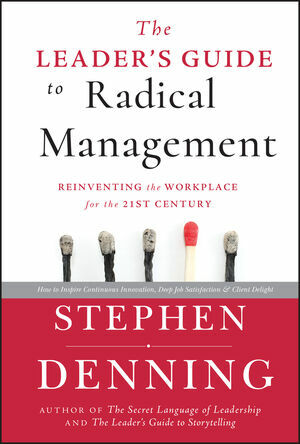 Stephen Denning is a leading writer who consults with organizations in the U.S., Europe, Asia, and Australia on leadership, management, innovation, and business narrative. In 2009, he was a visiting fellow at All Souls College, Oxford University, U.K. He is the author of The Secret Language of Leadershipa Financial Times selection in Best Books of 2007, and a 800-CEO-READ selection as the best book on leadership in 2007. 2 A Brief History of Management. 3 What Radical Management Means. Part One: The Seven Principles Continuous Innovation. 4 Principle #1: Delighting Clients. 5 Principle #2: Self-Organizing Teams. 6 Principle #3: Client-Driven Iterations. 7 Principle #4: Delivering Value to Clients in Each Iteration. 8 Principle #5: Radical Transparency. 9 Principle #6: Continuous Self-Improvement. 10 Principle #7: Interactive Communication. 11 A River of Cascading Conversations.